By Elizabeth McCarthy. Sid Harta Publishers, Melbourne, 2015. Paperback 320 pages. RRP $29.95 but discounts available. This book, published in August 2015, was written by a daughter of John Jess (1922-2003) who was MHR for Latrobe from 1960-72. As she was researching material for a biography of her father she became aware of his involvement as a parliamentarian with the second Royal Commission into the collision between HMA Ships Voyager and Melbourne on 10 February 1964. Elizabeth McCarthy was aged four at the time of the collision and says that her father did not discuss his involvement in subsequent events. Her research took her to press reports, Parliamentary records, the National Archives of Australia (NAA), the current RAN historian, the sons of Captain Robertson, Commander Everett, Lieutenant Commander Cabban and the President of the Voyager Association. Jess donated his papers to the NAA and these include correspondence from a concerned public, both naval and civilian. She opens with an outline of the collision, loss of life and rescue of survivors. Unlike today, survivors were left alone to cope with the trauma and in particular they were ordered not to talk to the press. Those considered fit were back at sea a week later. Prime Minister Menzies decided to establish a Royal Commission rather than agreeing to a Naval Board of Enquiry. The author indicates Menzies sought to protect the Government and the Australian Commonwealth Naval Board (ACNB). As the Royal Commission proceeded the public began to suspect there was something to cover up. Survivors were required to record their recollection of events. On being returned from Navy Office for signature, some related later to Jess that their report had been edited. Cabban, who was executive officer of Voyager until a month before the collision, sent a report to the Naval Board. It was not used as evidence. Jess’s misgivings arose from a combination of his distrust of power in general and senior Liberal politicians having control of that power. At the Royal Commission it became evident that the commissioners struggled with the minutia of ship handling, manoeuvres and communications required by a navy operating an aircraft carrier with a destroyer as plane guard. 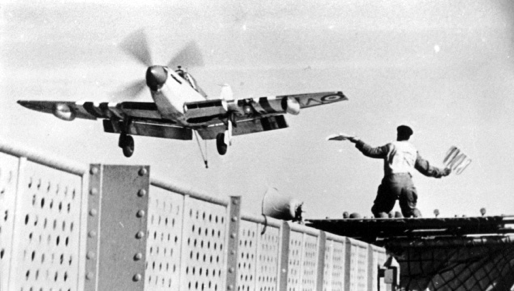 In particular, that the plane guard, at all times, must keep clear of the carrier. The commissioners seemed keen to challenge the actions of Melbourne’s bridge team. Captain Stevens and his family had secured legal representation whereas, initially, Captain Robertson had none. Following the Commission junior MPs sought access to transcripts of the commission. They were advised certain sections could not be tabled. The author covers the backgrounds of Captain Robertson and her father who was a cousin of Mrs Robertson. She says her father was inclined to speak out and records that the Menzies’ government was ruled by secrecy and strict obedience. Following the release of the Spicer Report of the Royal Commission, a debate was scheduled for Parliament. John Jess sought to speak and raise, in particular, the fact that Captain Robertson had not been interviewed by ACNB, that his appointment to HMAS Watson was not only sideways but downwards and that as a consequence he resigned his commission. By then Vice Admiral Hickling, RN, then retired and living in New Zealand, was keen to write a book. Captain Robertson spent time with Hickling who sought to clear Robertson’s name. Also, Hickling was aware of Cabban’s report although he did not refer to it in One Minute of Time, published in April 1965. Furthermore, Jess realised that Menzies was aware of Cabban’s report, however Menzies advised Jess to forget the matter. Later Jess realised his in-laws had been contacted by Menzies, urging them to persuade Jess to drop the issue. By this time Jess was sandwiched between Robertson, who did not wish to re-ignite the matter and Cabban, who did. Harold Holt became prime minister in January 1966 with the retirement of Sir Robert Menzies. Jess had a copy of Cabban’s letter delivered to Holt and sought to have the matter raised in the Liberal Party room. Even though scheduled it was removed four times and Jess was alone with his colleagues curious of his motives. A year later he was gaining some support from Liberal colleagues and he sought to make contact with the medical officer in Voyagerduring the ship’s deployment in 1963. This contact was denied as it became evident that the Secretary of ACNB was keen to protect the Board. In March 1967, despite obstruction of two prime ministers and two Ministers for the Navy a second Royal Commission was approved. John Jess advised Cabban that he would be subjected to intense criticism. The second Royal Commission found that Captain Stevens was unfit to command at sea. The book is well illustrated with photographs of dramatis personae, ships and the tracks of Melbourne and Voyager. There are over 600 footnotes but no index. The author challenges some aspects of Tom Frame’s book, Where Fate Calls, written in 1992. 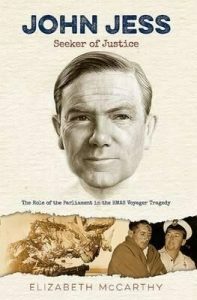 She has not one word of criticism of her father, nevertheless her book will be of great interest to all Australians familiar with the tragedy of the collision and subsequent events. The name Moreton is synonymous with naval history in southeast Queensland but to date little mention of it appears in our historical records. We trust this small tribute helps overcome this deficiency and may encourage others to write of their experiences when serving in this important establishment. While continuing his exploration of the east coast of Terra Australis in HMB Endeavour in May 1770, Captain James Cook named a series of features including Cape Morton, the prominent Glass House Mountains and, the bay between Cape Morton and the mainland, as Glass House Bay. Cape Morton was named after the Scottish Earl of Morton (James Douglas 14th Earl of Morton 1702-1768) who as President of the Royal Society was a patron of Cook’s voyage. During a 1793 translation of Cook’s journals the name was misspelt as Moreton and has remained thus. In his haste Cook sailed past Cape Moreton and did not enter Glass House Bay. The first European to enter and survey the bay was Matthew Flinders in July 1799. Commanding the colonial vessel Norfolk he discovered that Cape Moreton was the northernmost tip of a large island which he then named Moreton Island with Glass House Bay becoming Moreton Bay. In March 1823 a party of four ticket-of-leave timber cutters set off from Sydney in a thirty foot open boat which was disabled in a storm and washed ashore many days later on Moreton Island. Local Aboriginal people supplied food and shelter to the castaways and helped them construct a canoe in which they explored the bay. In November the same year John Oxley in the colonial cutter Mermaid called at Moreton Bay in search of a suitable site for a penal settlement. He was amazed to find the shipwrecked party who were able to lead him to a valuable source of fresh water – the important Brisbane River had been discovered, providing the finest supply of fresh water then known in the colony. Oxley named this after another Scotsman and Governor of NSW, Sir Thomas Brisbane. A year later Oxley returned in the colonial brig Amity and a penal settlement was established, which flourished until 1847 when it was closed in favour of free settlers. The first Royal Navy man-of-war to arrive in these waters was the 28-gun HMS Rainbowin 1827, under command of Henry John Rous. Aboard Rainbow was Sir Ralph Darling, the newly installed Governor of NSW. They discovered that another large island existed south of Moreton Island which Captain Rous then named Stradbroke Island after his father, the Earl of Stradbroke. 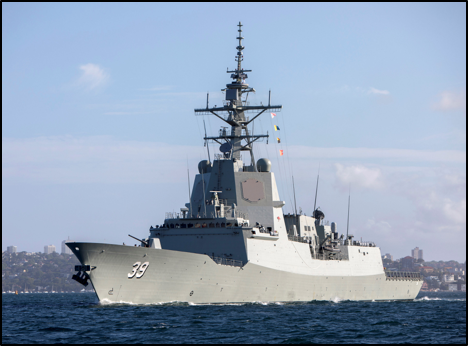 Our Navy has enjoyed a long association with Brisbane dating back to colonial times when the Queensland Marine Defence Force (QMDF) was raised in 1883 providing local naval defence. A shore depot was established on river frontage off Alice Street, in an area known as Garden Reach, near the Domain. The depot and slipway was used for training men in the naval reserves who served in the aptly named colonial vessels Mosquito and Midge. Offices for the QMDF commanding officer and his staff were provided in nearby Edward Street. Lieutenant Walton Drake took command of the shore based Naval Brigade on 1 January 1885 and raised two 50-strong companies of volunteers. A sub-marine mining (naval mine) store was erected at Fort Lytton in 1886 and later a mining drill hall was built at Alice Street. Naval stores facilities, later including coaling and oil fuel installations, were built at Kangaroo Point in 1887. In 1885 the older torpedo boats Mosquito and Midge were supplemented by two formidable new vessels HMQ Ships Gayundah (Lightning) and Paluma (Thunder). Despite their small size, 120 feet in length and 26 feet beam, they were well armed with one 8-inch gun forward and a 6-inch gun aft, plus three light guns. Following trials, Paluma’s guns were removed and she was converted to survey duties. These vessels did sterling service with Paluma decommissioning in 1916 and Gayundah in 1921. The poignant remains of the latter are still to be seen at Woody Point near Redcliffe and one of her 6-inch guns is on display at the Australian War Memorial. 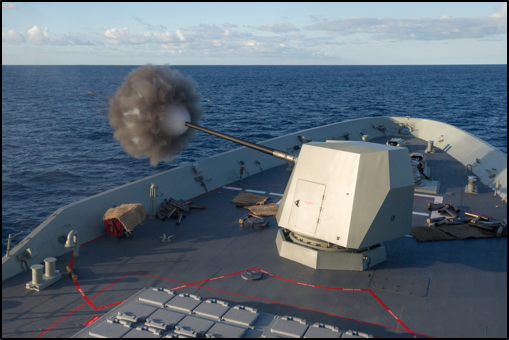 Gun drill continues this afternoon and was fairly successful – blowing squally and raining – prize firing tomorrow. Marconi insulators were interfered with by rain but easily rectified and communications since has been good. Good night. The most important personality to serve in the Queensland Naval Forces was Captain William Rooke Creswell who became commandant on 1 May 1900. However his term in residence was to be short. He was released from his duties to take command of the South Australian gunboat HMCS Protector with an Australian contingent bound to help suppress the Boxer Rebellion. Upon his return in 1901 Creswell was deeply involved in the creation of distinctly Australian defence forces and in February 1904 was appointed to the newly created position of Naval Officer Commanding the Commonwealth Naval Forces. An impressive purpose-built QMDF headquarters building was opened at 3 Edward Street in 1901. At this time, in addition to the headquarters and Brisbane district command, further district elements of the marine forces were to be found at the major Queensland ports of Bundaberg, Cairns, Mackay, Maryborough, Rockhampton and Townsville. All had instructional staff, usually headed by a Gunnery Instructor, and a company or companies of the Naval Brigade, plus Naval Volunteer Cadet Corps. With Federation also occurring in this year and the Commonwealth Naval Forces (CNF) legislated on 01 March 1901, QMDF assets were officially transferred to the CNF but this did not occur until December 1907. The CNF became the RAN in 1911. At the time of Federation the Queensland Marine Naval Forces numbered 750 men of all ranks. 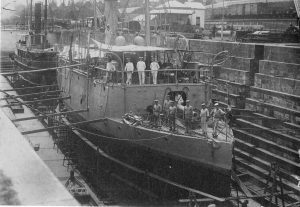 The period of WWI largely passed by with little impact upon Queensland naval resources other than ships transiting to and from New Guinea and the need to maintain fuel and logistic stocks. However, members of the Queensland Naval Reserve served with the Australian Naval & Military Forces in German New Guinea in 1914. 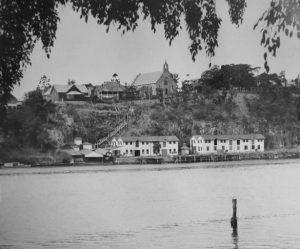 During 1916 an explosives manufacturing facility was established on river frontage at Colmslie which remained in production until 1926 when it was transferred to Melbourne. The inter-war period saw an inevitable reduction in activity with the fleet greatly reduced and it was not until the outbreak of WWII that major changes occurred. In September 1939 the Alice Street Depot was commissioned as HMAS Penguin IV but on 1 August 1940 was renamed HMAS Brisbane,better reflecting its locality. Japan’s entry into the war in December 1941 saw southeast Queensland become an important strategic hub following the introduction of American forces into this area. On Christmas Eve 1941 the first US troops began arriving in Brisbane after their eight ship convoy, escorted by the cruiser USS Pensacola, was diverted from resupplying the Philippines. Brisbane, regarded as a ‘big country town’ at that time, was awoken from its slumber with the arrival of thousands of American military personnel and their associated infrastructure. A surprise for many of the locals was the exotic sight of numbers of African-Americans troops. The population of 300,000 doubled to 600,000 almost overnight. 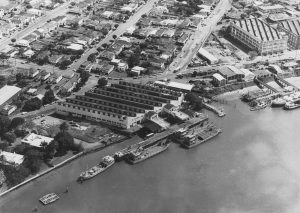 A US submarine base was established at New Farm, additional naval stores depots, victualling yards and maintenance facilities were created, and an increased number of personnel served in combined operations training camps situated at Toorbul and Bribie Island. In 1942 the old Colmslie explosives factory was converted into a small ship base supporting the Fairmile Motor Launches and Air-Sea-Rescue craft which were transiting north for service in Darwin, Timor and New Guinea. Coinciding with this expansion was a decision for another name change with HMAS Brisbane becoming HMAS Moreton on 1 October 1942. The chief reason was to avoid confusion between the titles of the Naval Officer-in-Charge Brisbane (the region) and the Commanding Officer HMAS Brisbane (the depot). The first unofficial badge of HMAS Moreton had its origins in the Colmslie Fairmile base. This depicts a bow view of a motor launch at speed within a rope grommet, surmounted by a naval crown. Beneath was a Latin motto ‘Ago Quod Ago’ meaning ‘What I do, I do well’. The establishment’s zenith was tied to the decision by the Supreme Commander Allied Forces in the Southwest Pacific Area, General Douglas MacArthur, to base his headquarters in Brisbane from July 1942. 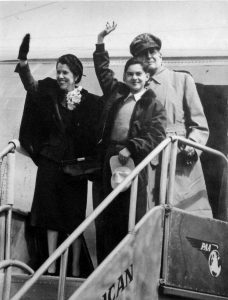 MacArthur, accompanied by his wife Jean and their four year old only child, Arthur, and his extensive staff maintained their primary base here until October 1944. The first squadron of six older S-class American submarines with their tender USS Griffin arrived on 15 April 1942 and these were gradually replaced by new generation fleet submarines. Outside the United States, Brisbane now became the premier US submarine base in the Pacific. In addition to boats based at Capricorn Wharf New Farm, many more called here for support, repairs and refitting at the South Brisbane Dry Dock (the larger Cairncross Dock not becoming operational until June 1944). At its peak up to 6,500 USN personnel operated out of Brisbane but this was insignificant compared to the total US Army ground and air forces, which comprised the majority of the 75,000 Americans in southeast Queensland in December 1943. But as quickly as they arrived the American forces were withdrawn to New Guinea and other forward bases as the enemy was pushed north. The last refit of a USN submarine was in March 1945 but this was not the end of Brisbane’s submarine war as most of its facilities were leased to the British Pacific Fleet resulting in the establishment of a depot known as HMS Furneaux. On 20 April HMS Bonaventure arrived with her flotilla of six midget submarines embarked. These small boats with a four man crew included two Australians LEUT Max Shean, DSO and Bar, RANVR and SBLT Ken Briggs, DSC, RANVR. Serving insubmarineXE4 both men were to win fame in destroying the vital Japanese communications cables between Saigon, Singapore and Hong Kong. A Royal Naval air maintenance facility was also established at Archerfield known as HMS Nabsford.The life of the Royal Naval facilities was short-lived, with war’s end all personnel were shipped home and the RN establishments closed at the end of October 1945. While US servicemen were welcome in our darkest days when a Japanese invasion seemed a reality, there was some friction. This was mainly caused by the resentment of Australian troops, hardened by three years of war, to their more glamorous and better-paid American counterparts monopolising their womenfolk and taking over the city’s entertainment. On 26 November 1942 in what became known as the “Thanksgiving Day Riots” or more colourfully “The Battle of Brisbane” erupted when an armed American Shore Patrol accidentally shot and killed one Australian soldier with other Australians suffering gunshot wounds and hundreds of Australian and American servicemen injured. The body of an American sailor was later found floating in the harbour, while this was officially regarded as accidental drowning rumours persisted he had been beaten and thrown into the river. On Thursday 16 August 1945 about 10,000 servicemen and women from Australia, Britain, the Netherlands East Indies and the United States proudly marched six abreast in Brisbane’s Victory Parade. Despite the cessation of hostilities Moreton was again busy as a demobilisation facility for those returning from active service. Numerous Fairmiles and Harbour Defence Motor Launches were decommissioned at Colmslie and prepared for disposal. A decision to disband the Naval Reserves in 1946 saw the Alice Street Depot temporarily closed and decommissioned, although the name Moreton continued to be used by the Resident Naval Officer in nearby Edward Street. In 1949 the Alice Street Depot was reactivated as a training depot for Naval Reserve personnel, including National Servicemen and later Sea Cadets. But this did not last long as in 1952 reserve training was moved across the river to facilities at Kangaroo Point. Access to the new facility was either by boat or via 154 steps from Main Street. In 1959 training was again relocated to Merthyr Road at New Farm to a facility previously used by the Royal Navy as a wartime victualling yard. The following year the New Farm facility was commissioned as HMAS Moreton. During this period the former corvette HMAS Mildura was acquired as a static training ship and provided valuable service until sold for scrap in 1965. Over the next three decades Moreton served as home to the Brisbane Port Division of the RANR as well as the Sea Cadets, later renamed Naval Reserve Cadets. Several vessels were assigned as tenders including the General Purpose Vessel (GPV) 957and the Motor Refrigeration Lighter (MRL) 253. The latter was subsequently renamed Training Vessel Gayundah. The Attack class patrol boat HMAS Adroit was also assigned there from 1968 to 1974 when she rejoined the fleet. In 1973 the first of the Landing Craft Heavy (LCH) HMAS Brunei was commissioned and based at Moreton which became the Headquarters of the 1st Australian Landing Craft Squadron. 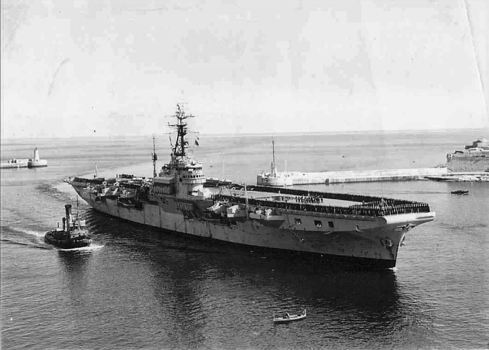 The title was changed in 1979 to the Australian Amphibious Squadron encompassing the introduction of the amphibious heavy lift ship HMAS Tobruk.This additional role saw a requirement for a wharf capable of berthing Tobrukas well as six LCHs. Consequently in 1981 the Capricorn Wharf and buildings downstream from Moreton were leased, becoming known as Moreton North. Following the Viet Nam War changes in strategic thinking called for defence forces to be moved further north and west. This saw the commissioning of the patrol boat base HMAS Cairns in 1974 and the major fleet and submarine base at HMAS Stirling in 1978. These significant changes resulted in a greatly decreased need for naval services in southeast Queensland with a resultant withdrawal of personnel. Until the end of 1985 Moreton was home to over 1,000 permanent naval personnel, seven ships, 200 active members of the RANR and the Queensland Division of the Naval Reserve Cadets. It also hosted a 100 strong cadet unit TS Gayundah. But changes were afoot and in 1986 the Amphibious Squadron was disbanded with Tobruk relocating to Sydney and the LCHs transferred to Cairns and Darwin. 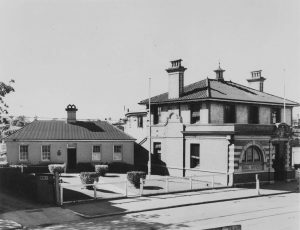 In August 1986 the office of Naval Headquarters Queensland was relocated from its long-time residence in Edward Street to Moreton. The old headquarters building was sold in 1998 and added to the Queensland Heritage Register in 2013. As facilities were gradually withdrawn the base scaled down and in 1993 the Government announced that three RAN establishments, including HMAS Moreton, would be closed as cost saving measures. Moreton decommissioned on 11 May 1994 when remaining naval support was transferred to offices at Bulimba Barracks. The naval section was known as Naval Headquarters – South Queensland (NHQ-STH QLD). As a further economic initiative, in 2015, the Government announced that Bulimba Barracks is to be sold as a planned residential development. 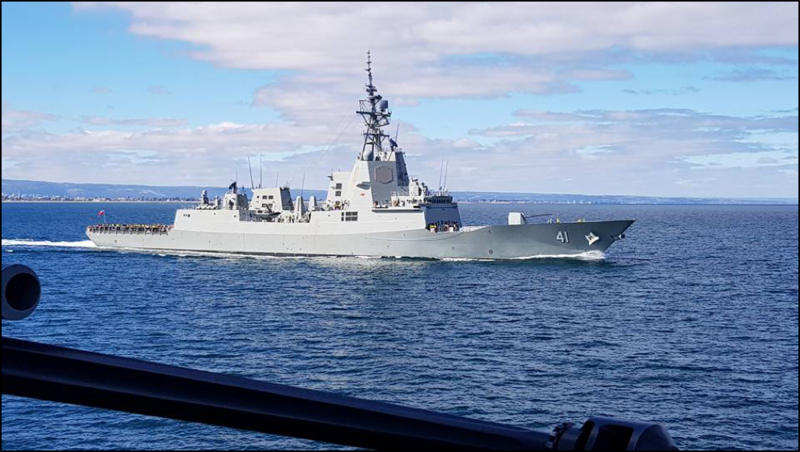 However the naval element has been retained and here a new HMAS Moreton was commissioned on 14 May 2016. The Governor of Queensland, the Honourable Paul de Jersey AC, joined the Chief of Navy, Vice Admiral Tim Barrett AO, CSC, in the commissioning ceremony. The establishment will have a small permanent Navy contingent and will be home to a number of Reserve units including Dive Team B and the Queensland detachment of the Navy Band. The facilities will also accommodate the Australian Navy Cadet Training Ship Gayundah. Regrettably at this time the magnificent building of great naval historic significance at Edward Street, with its long-standing and important association with the naval forces of Queensland and Australia, remains unloved and is looking for rescue by a handsome farsighted sailor. 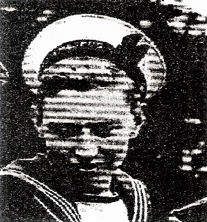 Not a Real War – A Sailor’s Experiences in a Soldier’s War by Paul Longley. Published by Book Pal, Brisbane, 2015. Paperback, 224 pages with b & w photos. Available from Amazon $22.46 or Kindle $2.91. While frequently in the news for all the wrong reasons very little is known of Somalia so this book by the then Lieutenant Paul Langley, RAN telling of his in-country experiences is most welcome. Many may have seen the film Blackhawk Down which provides some idea of the problems experienced in this lawless land during 1993 when Paul was posted as a Movement Control Officer to assist arranging logistic support to the Unified Task Force (UNITAF). This was a United States led, United Nations sanctioned, multinational force which operated in the Republic of Somalia from December 1992 to May 1993 to provide a protective environment for conducting humanitarian aid to prevent starvation. The Australian commitment to this conflict was brief but none the less significant with a 1,000 man strong battalion sized group from 1RAR led by the then Lieutenant Colonel David Hurley, mostly embarked in HMA Ships Jervis Bay and Tobruk.The main Australian contingent returned home in May 1993 when the initial force was replaced by an expanded United Nations Operation in Somalia (UNOSOM) with a mandate to help rebuild the Somalia state. The small Australian logistics group to which Paul was attached remained for another seven months finally withdrawing in November 1993. Paul tells his story of a sailor in a soldier’s war in a unique style with ease and some humour in many small easily read chapters. It was a conflict with many and constant dangers from suicide attacks, small arms and IEDs with over 150 UNOSOM casualties, including four Australians and many more Somalia casualties. 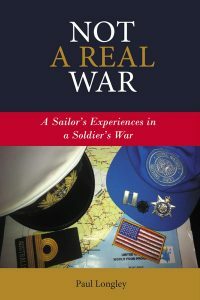 We learn how a sailor finds his feet and learns to fit into an essentially Army run unit, the varied daily routines, many mundane but all important, and others where danger lurks and quick reactions are required with adrenalin pumping. Through the author’s keen powers of observation we glimpse inside the world of combined military operations at work in some of the most demanding of conditions in a very destructive environment.